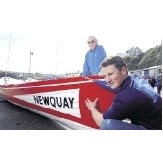 The oldest rowing boat still in use, the pilot gig Newqay, was launched over the weekend after restoration by Ralph Bird. She was built in 1812, the year Charles Dickens was born and Napoleon invaded Russia. Details at thisiscornwall.co.uk.